This picture on the BBC website had me wondering what the hell Batman was doing fraternising with the enemy! 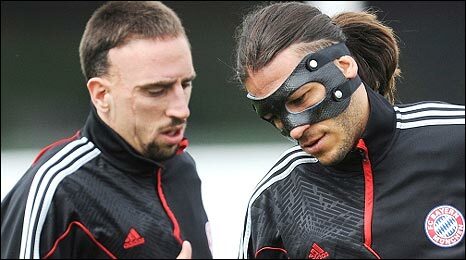 For those not in the know thats Ribery and Demichelis of Bayern Munich. It is important to remember that I love Cricket, which is one of the reasons I started CricHatter and why I will be doing something cricket related most days during the summer. You may have noticed that my Twitter bio changed, to include a couple of other sites I am now either running or involved with. Today I wanted to talk a little more about CricHatter.com. A new Cricket (obviously) related site which I have recently set up. A site with Cricket news, editorials on the sport, individual teams or even a single player. I hope to turn it into an advice platform for anyone who wants information about Cricket related matters. Ranging from tips on skills, technique or the game, to advice on equipment, clubs and tours. Check it out, let me know what you think, follow it on Twitter (@crichatter).